Many reptiles call the desert home, and the Gobi Desert in Mongolia and China is no exception. Residents of the Gobi include a number of poisonous vipers -- some varieties are found nowhere else. The central Asian pit viper (Gloydius intermedius) is endemic to the Gobi Desert, meaning this snake is found nowhere else in the world. It's a medium-sized pit viper, reaching about 31 feet. It has a stout body shape. There have been no confirmed fatalities, but there is also no known antivenin to this snake's bite. This snake is rare and not very well documented. 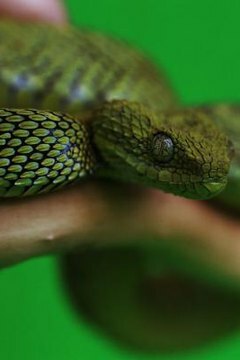 Most of what is known about the central Asian pit viper is conjectured from its relative, the more widespread G. blomhoffi. Haly's pit viper (Gloydius halys) is also known as the Gobi pit viper, since it too is endemic to this desert. Adults range from 20 to 28 inches typically, though individuals have been found measuring three feet in length. Like all vipers, it's venomous. This species has a hemotoxic venomous, that also has neurotoxic effects. This means that this species's venom kills by acting against the blood and nervous system. Still, human deaths from this species are rare. The European adder (Vipera berus) is not endemic to the Gobi. This species is widespread from Europe to Japan. It's also unusually cold-tolerant for a snake. In the northernmost parts of its range, it's been seen crawling over snow. It's venomous, but the bite is very rarely fatal to humans. The average adult reaches 22 inches, but some specimens reach three feet in length. The steppe rat snake (Elaphe dione) lives in the Amur River Basin. This is technically just outside of the Gobi Desert, but the snake still lives in the general area. This species lives across a wide range, including much of northern Asia. As such, its common names include the Siberian rat snake, the Russian rat snake and the Korean rat snake. It prefers moist habitats and is nonvenomous.